Being able to save your own garden seeds year after year has many advantages. You save lots of money. You are not dependent on retailers for your seeds. You're getting pure seeds and not ones genetically engineered or covered in poisons and you can trade seeds with others. Make sure the seed packet has "heirloom" printed on the front. Hybrid seeds will not work! I let my mustard plants mature so they produced flowers to give the bees something to pollinate. Then, I got the great idea of saving the seed to make homemade mustard! These particular seeds came from a Martha Stewart seed packet I purchased at Home Depot. It contained two different types of mustard and several kinds of leaf lettuce. While I'm not a big fan of mustard greens, I love making gourmet mustards i.e. spicy honey mustard, cranberry mustard, Octoberfest mustard etc. In the photo you can see flowers at the tips of the plant and long slender green seed pods below the blossoms. I wait until the seed pods are fully developed to insure viable seeds. Yesterday we had a pair of feral lovebirds hanging from our mustard plants eating the seeds, so I knew they were ready to harvest! 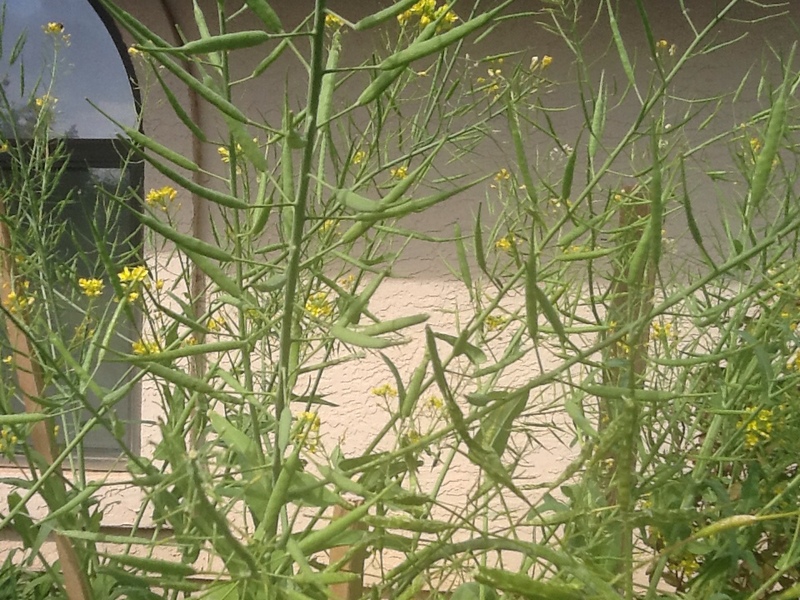 FRESH GREEN STEMS LOADED WITH MUSTARD SEED PODS. HANGING MUSTARD PODS TO DRY IN THE SPARE SHOWER. Notice how the seeds have dried out in just 3 days. 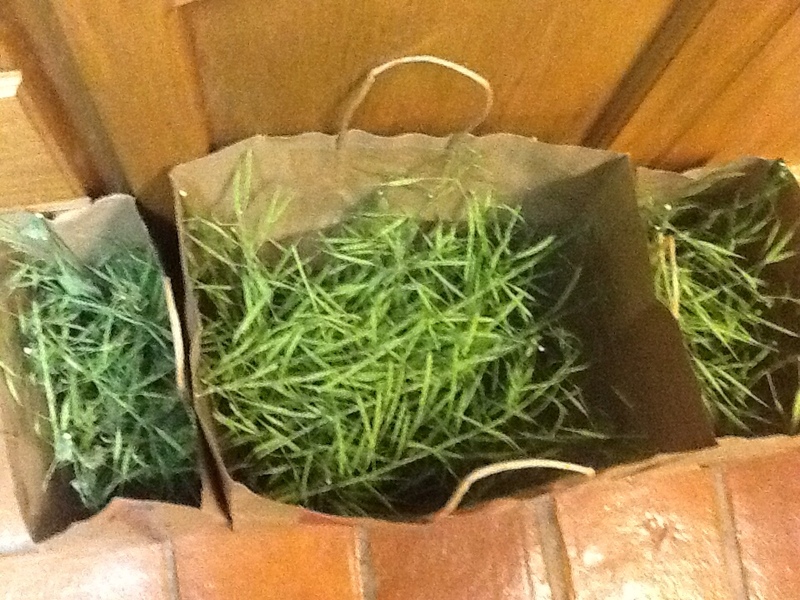 I clipped the individual stems covered in seed pods and placed them in paper grocery sacks to dry. As the pods dry, they will twist open, sending seeds flying in all directions! 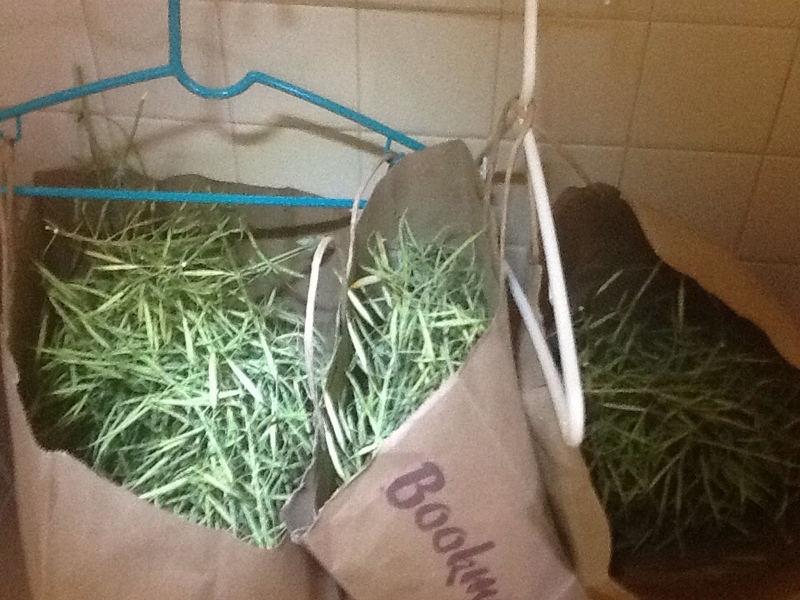 The grocery sacks will catch individual seeds, making seed saving a breeze! I'll save a few mustard seeds to sow for next year's crop, but the majority will be used for bread and butter pickles, kick-n-it relish and gourmet mustard. This will save me a bundle and my seeds will be fresh and organic! Last month I used this same technique to harvest bok choy seeds. When planning your garden this year look for O.P. (open pollination) seeds in the seed catalogs. When buying individual seeds look for heirloom to be printed on the front of the seed packet. Most plant nurseries carry heirloom seeds. You may find seeds labled "organic" on seed packets; just because they use the word "organic" doesn't mean the seeds are open pollination, heirloom seeds. Remember hybrid seeds will only give you one crop and you can't save the seeds from those plants for following year. Seed saving can be quite fulfilling, and they make great stocking stuffers for the gardeners in your family! That's the way we do it . . . Over at Julie's!! Great information! We love gardening and I use as many seeds as we can to start new plants. Did not know this information. Glad to help! I've been harvesting our seeds for a while but not on such a large scale. Now our garden is all heirloom except for some of our tomatoes. Last year I harvested seed from radish, lettuce, winter squash, melon, carrots, broccoli, bok choy, peas, beans, hollyhocks and sunflowers. I grow sunflowers for their beauty and for our parrots. These are tricky seeds to save because the whole neighborhood of birds visit daily to see when "their" sunflower seeds are ready to be harvested!